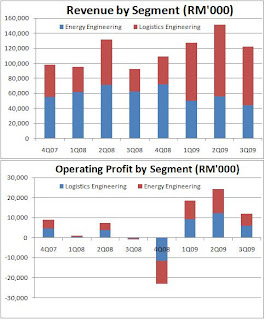 Scomi Engineering Bhd's third quarter net profit for the period to September 30 2009 jumped nearly threefold to RM11.8 million, mainly due to strong contributions from its rail business. Revenue rose by a third because of higher contribution from overseas markets led by India. The logistic engineering division recorded higher sales from its rail unit with the start of a monorail project in India, it said in a statement to Bursa Malaysia yesterday. Scomi Engineering said it continued to derive 71 per cent of its revenue from overseas markets with India contributing 39 per cent. For the nine months to September, Scomi Engineering posted a net profit of RM49 million on revenue of RM400 million. President Hilmy Zaini said the recent global economic downturn, which led to shrinking drilling activities in the oil and gas sector, had affected the company's energy engineering business. But it will continue to contribute positively to its earnings for the remaining quarter with the expansion of existing facility in Indonesia and relocation of Australia and Thailand machine shops to better facilities. As for the logistics engineering business, contribution from the rail unit will continue to lead the company throughout 2009. "With the worldwide increase in demand for efficient, reliable and cost-effective transportation solutions, we anticipate that the core business driver from 2009 onwards will be in the public transportation sector," Hilmy said. Hilmy said Scomi Engineering will continue to pursue opportunities in monorail projects and establish a global presence. The company sees several potentially big monorail projects in Sao Paolo after Brazil recently secured the rights to host the 2014 World Cup and 2016 Olympics. Performance: On y-o-y basis, earnings jumped nearly threefold, mainly contributed by its monorail projects and partly due to improved margins from its Machine Shop Division. Nonetheless, net profit actually dropped by 38% on q-o-q basis due to lower revenue recognition from its rail projects and weaker connector sales from its Machine Shop Division. Monorail: Going forward, earnings will continue to be led by its monorail project. To recap, Scomi Engineering secured a monorail project in Mumbai costing RM1.85bil of which Scomi Engineering's stake is valued at RM823.3mil. The monorail is 19.5km long and construction will last 30 months (around April 2011). As shown by its performance over the past 3 quarters, its monorail project contributed a large part of its revenue and earnings, sustaining its performance amid declining sales from its Machine Shop Division. Earnings will most likely be maintained or rise even higher for the next 1.5 years on the back of higher recognition from its monorail project. Machine Shop: On top of that, the management also indicated that its Machine Shop Division is expanding its facility in Indonesia and relocating its machine shops in Australia and Thailand to bigger and enhanced facilities. Coupled with continued efforts to optimize its operations and control overheads & costs, this division will continue to perform satisfactorily. More monorail projects to come? The company is currently bidding for monorail projects in Brazil (US$2.5bil - Gigantic!! ), Bangalore-59km (US$2.4bil - To start in mid-2010 and complete in 2013) and Bahrain-23km (US$1bil - To start in 3Q2010 and complete in 1Q2016). Should the company secure any of the monorail projects, earnings will surge in the coming years with EBIT margins above 10%. Globally, it is one of only two integrated monorail system providers to offer end-to-end solutions including fabrication and integration of the monorail rolling stock (travelling component of a rail system) & electro-mechanical system, which further enhance its chance of bidding for these projects successfully. Valuation: Net profit might touch RM60mil in 2009 and even higher in 2010 on the back of recovery in drilling activities in the oil & gas sector, without imputing any successful bids in monorail projects. This translates into EPS of at least 21.7 sen and PER 2009 of only 6.6x. Price should surge with awards of these monorail projects and stronger quarterly earnings going forward. Stock is quite cheap in my opinion.